I never can go anywhere directly in this town. I get bored, and there’s time and space galore, with the desert waiting so tantalizing, so immediate, around every corner. I usually find myself driving aimlessly, burning gas, heading out into the desert for a few minutes, picking a random road to cruise down and see what I find. Today, I was aiming for the library, and figured on taking a back way that I’d heard might meander eventually back into town. Or might not. I was going to find out one way or another. So I headed on past the flat empty farmlands of the Escalante valley, past old wooden fences and sprinklers shooting constant sprays of water up into the air. The road Y-ed off again, and I veered off to the left, and found, after a while, the road plunging down into a creek bed. I inched the car up closer to it, debating just how stupid it would be to try driving across. This was probably the way back into town, and I figured about a 70% chance my KIA could make it and a 30% chance that I’d end up stuck in a creek. So, I decided I needed some practice driving backwards anyway, and managed to reverse my way back to the Y without backing into a ditch. The car bounced along the dirt road, and I swung from one side to the other to avoid ditches and potholes. The road here wasn’t even on my GPS, so my little X-Wing floated in a sea of gray and green. 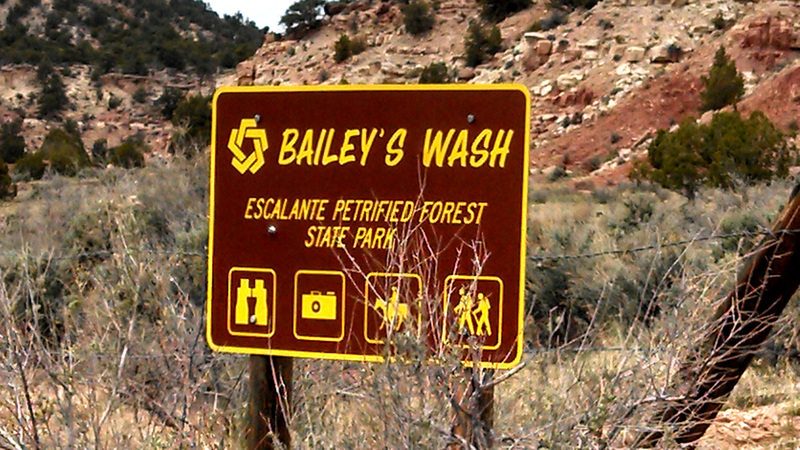 The road ended in a loop, with a sign telling me I was at the border of Escalante Petrified Forest State Park, and Bailey’s Wash. I decided to hang around here for a little while and enjoy the desert. Making my way out onto the edge of the wash, I kicked off my sandals and slid down the smooth sand into the stream bed. The sand whispered, barely audible as I skidded down through it. I mulled around for a bit at the bottom of the creek bed, over coarser sand and larger pebbles that had been dropped there when the water flowed. 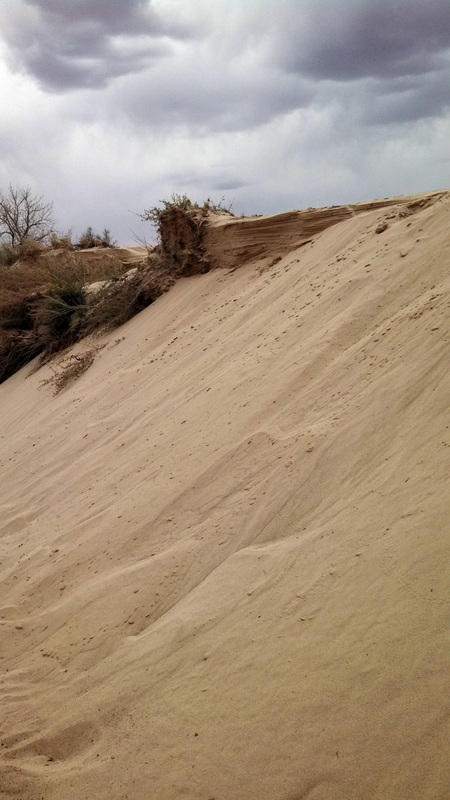 Then I made my way back up the side, sinking up to mid -calf in the cool, powdery sand with each step. I love the quiet out here, just a few minutes away from town. I love the wildness of this place, a place I can just stumble upon and wander through things like this, this white-sand wash, this dried up creek-bed in the shadow of immense cliffs. I love that it feels like an unlimited playground, with endless things to discover and explore. I don’t so much love that the library is only open for two hours today, and that it’s one of the only places in town to get a reliable internet connection, but that’s something I can live with if it means being in the middle of this gorgeous landscape for a little while.